For at least a thousand years, Vishwanath has been the preeminent Shiva Linga in Varanasi. Vishwanath is also called Vishveshvar. Both names mean "the lord of all". Despite its fame, today's Vishwanath Temple has none of the magnificence, architectural splendor or antiquity of India's great classical temples in Orissa or South India. It was built as recently as the late eighteenth century under the patronage of Queen Ahalyabai Holkar of Indore. The history of the previous temples that housed the linga of Vishwanath is, in a nutshell, the history of Varanasi over the past thousand years: a tale of repeated destruction and desecration. Today atop the ruins of old Vishwanath Temple, sit two different mosques, one built in the thirteenth century by Razia and one in the seventeenth century by Aurangzeb. The present Vishwanath Temple is crowded into the interior of this tightly woven city and its architectural features are hidden from proper perspective behind the compound wall. As one approaches Vishwanath, there are flower merchants whose baskets are heaped with garlands of marigolds and jasmine. Entering through the doorway from Vishwanath lane with their offerings of pushp (flowers), naivedya (sweets) and Gangajal (Ganges water), pilgrims come into a large rectangular courtyard in the center of which stands the temple itself. The Linga of Vishwanath is set into the floor of the temple in a square solid-silver recessed altar. The seat of the linga is also silver and the shaft of the Linga is smooth black stone. Shiva is worshipped at five principal aratis during the day, from early in the morning until late at night. In the evening shringara arati, the linga is elaborately decked with flowers. At any time of day, however, worshippers will come, chanting "Har Har Bum Bum!" "Har Har Mahadev!" "Jaya Jaya Vishwanath Shambho!" "Om namah Shivaya!" They drench the linga with water, cover it with flowers and bilva leaves and bend down to touch it with their hands. Although the interior of this important temple is neither very large nor very elaborate, the atmosphere of worship and devotion is powerfully impressive. The sights and sounds and smells of the temple, the shouting and chanting and clanging of bells, even the jostling of the crowds, all contribute to the aura of sanctity. Not only does Hindu worship make use of the senses in directing them toward the divine, but the Hindu sensibility appreciates the intensity of devotion brought to place by the crowds of worshippers. As one of the priests of Vishwanath temple explained, "Countless people have come here with worshipfull hearts and have centered their devotion here at Vishwanath for hundreds of years. By virtue of that history, this place is special. There is a saying, 'Pilgrims make the tirtha.' So this linga is significant partly because so many people have centered their devotion here for so long." Only 150m south of Durga Temple is the modern marble shikhara-style Tulsi Manas Temple, built in 1964. Its two tier walls are engraved with verves and scenes from the Ram Charit Manas, the Hindi version of the Ramayana. Its author , poet Tulsi Das, lived here while writting it.This Temple is on the spot where Saint Tulsidas composed the Ramayana in Hindi (The Ramacharitamanas). The King of Nepal had built this temple on Lalita ghat in Nepali style. The Nepali temple is also called the 'Kathwala temple'. The temple has some magnificent woodwork. Tourist from all over the world come just to see this temple which has no comparison with any other temple in India. The workers who carved this temple out were brought from Nepal. The wood used in the temple is also found in Nepal. The speciality of this wood is that termites do not eat this wood. 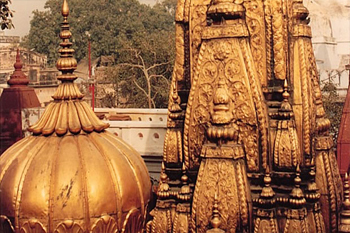 Sankata Devi is known in Kashi as one of the most powerful temples in the entire city. Sankata Ji as she is called, is located high above the Sankata Ghat in the labyrinthine lanes of the city. Sankata Devi means "Goddess of Dangers", for she is the one who vanquishes dangers for her devotees. Sankata Devi was originally a Matrika, one of the mothers. In Puranic Stories she is called Vikat Matrika, the "Fierce Mother". Sankata Devi is a self-manifested goddess. Kedar means the field where the crop of liberation grows. Therefore, that place became famous as Kedar, both in Kashi and in the Mountains. The original Kedar is high in the Himalayas in the area called Uttara Khanda (North Country). There at an altitude of some 12000 feet sits Kedarnath. Kashi's Kedar is the anchoring temple of the southern sector of the city, called Kedar Khanda. It is one of the most popular and venerable temples of southern Kashi. Kedar is a river Temple, sitting at the top of an impressive ghat high above the water's edge. From the river, the temple is distinguished by its vertical red and yellow stripes. Kedar is the religious focal point of the southern part of the city. There is a quite and deep piety almost palpable here and it is uninterrupted by the noisy throngs of pilgrims who hurry from Dashashvamedha Ghat to Vishvanath and its surrounding Temples. The pilgrims from outside don't generally go there. They don't know about it and the guides don't take them there as the pujaris in the temple don't give any payment for bringing pilgrims. Kedar primarily remains a temple for the devoted residents of that area. The darshana of Annapoorna always accompanies the darshana of Shiva Vishvanath. Annapoorna is Kashi's queen. She is known in the Kashi Khanda as Bhavani, the female shakti of Bhava, "Being," one of the names of Shiva. Today, she is often called Annapoorna Bhavani. The name Annapoorna means "She of Plenteous Food." She is called the "Mother of the Three Worlds," and she promises to those who come to her what only a mother can give, naturally and freely : food. Laat Bhairava, known to the Puranas as Kapali Bhairava, is of particular intrest. This image of Bhairava is a pillar, encased in copper and s,eared with vermilion. Thus it has the name Laat, the staff of Bhairav. This pillar once stood in a Hindu temple complex, but in the time of Aurangzeb the temple was destroyed and the site became a muslim tomb site. The pillar, however, was wisely left intact. Muslims continued to permit some access to the pillar and received part of the offerings in return. The pillar was once much taller than today. A French traveller tavernier saw the Laat Bhairava in 1665, during the reign of Aurangzeb, and described it as being thirty two to thirty five feet high. In 1809, it was toppled during a spate of Hindu-Muslim rioting. The Laat was pulled down and its broken pieces hauled away. Only a stub remained, and it is that remainder, now capped in metal and covered on special accasions with a cloth sleeve, that is honoured today. One hundred and ninty years after this violent communal disturbance, the Laat Bhairava area is still vulnerable to communal conflict, and a police guard is permanently stationed there to patrol the area of Bhairava's Laat. Kaal Bhairava, the "Black Terror," is widely known as the Kotwal, the "police chief," of Kashi, and the section of the city in which his temple stands is known as Kotwalpuri. Bhairav is considered a fearsome manifestation of Shiva. He wears a garland of skulls and carries a club of peacock feathers. Kaala Bhairava, whose name, Kaala means both Death and Fate, in addition to meaning Black. He is the black one who has also assumed the duties of the God of Death in Kashi. Even Death, it is said, is afraid of Kaala Bhairava. Kaala Bhairava's temple today is one of the most intresting in all Banaras. Entering from the street , through a door guarded by Bhairava's mount, the dog, one finds a fine courtyard, in the center of which is the main shrine of Bhairava. Only the silver face of kaala bhairava, garlanded with flowers, is visible through the doorway of inner sanctum. The rest of Bhairava's image-said to be pot-bellied, seated upon a dog, holding a trident-is hidden behind a cloth drapery. For many centuries, this temple was a spiritual center in Kashi for the most severe of Shiva ascetics, the "Kapalicas" or "Skull-Bearers," and their later descendants, the Gorakhnathis. Today, however, the temple is no longer the exclusive domain of such extremist yogis and is, rather patronized by ordinary householders for his protective blessings. Although this temple is popular and beloved among those who live under its influence in the surrounding Kotwalpuri section of the city, it is not a mandatory stop for pilgrims today. Generally people have darshana of Vishvanaatha and Annapoorna, and then they leave.